← The Prison Entrepreneurship Program – An Inspirational Story About Changing Lives! What do view binders, office supplies and the Olympics have in common? You don’t expect to see those three things mentioned together in the same sentence. Zuma Office Supply vendor Samsill, has put together a cool video using the common office supply item, view binders, to show their pride for our American athletes. 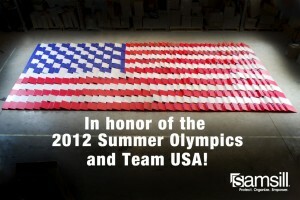 Check out the video below from Samsill in honor of the 2012 Olympics, and Team USA! We thought you’d like to see this unique way of showing the American Olympic spirit as a tribute to our Team rolling through London. From Gabby Douglas to Michael Phelps, and Rebecca Soni, Team USA has put on a wonderful performance thus far, and we aren’t even to Track and Field yet. Samsill is one of the world’s largest independently owned manufacturer’s of office supplies like ring binders, business cases, sheet protectors and laptop cases. To show their Olympic spirit, they took 526 red, white and blue three ring binders and created an awesome American flag covering 22 feet by 12 feet. Show your support for Team USA! Zuma is proud to count Samsill as one of our manufacturer partners. As a family owned, independent company, we like to work with similar independent companies who do business the right way. We all have a stake in the economic health of our great country, and supporting independent, local companies is crucial for Americans to keep jobs in the USA and keep our nation strong. So, here’s to Team USA and the 2012 Olympic games! And remember, do good work with Zuma Office Supply. This entry was posted in Office Supplies and tagged office products, office supplies, Olympics, Samsill, three ring binders, view binders. Bookmark the permalink.